Never being one to sit still somewhere for too long, I decided we needed to rent a car today and drive out to the coast to check out the Lewis and Clark National Historical Park in Astoria, OR. We got up early, hopped the Portland Light Rail to the airport, picked up our car and took off! The light rail in Portland is awesome, just in case you've never been on it. Clean, and efficient, and only $2.50 to anywhere you want to go! The Lewis and Clark National Historical Park was neat - they have a replica fort representing the one that L&C wintered in when they were in the area, and some good information about their journey. Lewis and Clark are like superheroes in these parts - there are tons of things named after them! After that, we checked out a bit of Astoria. In case you didn't know, parts of The Goonies were filmed in the town, so we also went to the Oregon Film Museum. 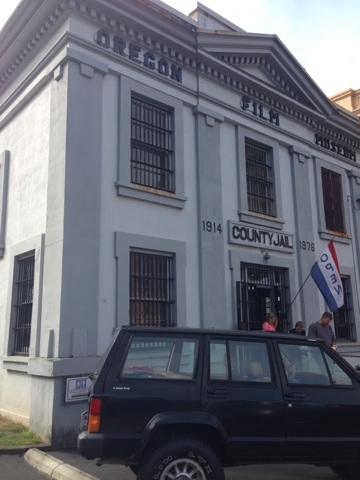 It's tiny, and not that impressive, but we love The Goonies, so it was cool to see the jail cell where one of the Fratelli brothers pretended to hang himself to get out of jail, the museum where Mikey's dad worked, and the restaurant where Chunk smashes the milkshake up against the window during the opening car chase scene. There was mad traffic going toward the coast on our way back - we then remembered it was the beginning of Labor Day weekend. Looked like all of Portland was headed to the beach for the long weekend - good thing we were headed the other way! We hit up a mall in Portland, and bought nearly one of everything that H&M there had. Finally, some normal clothes again! We won't know what to do with ourselves :) After some lovely food court fare, it was getting late and we were getting dirty looks from the food court janitorial staff since it was nearly closing time and we were dirtying up their clean tables, so we headed for the airport to return the car, then hopped back on the light rail for the ride back downtown. Taylor Swift had a concert near the convention center, and at nearly 11pm, tons of teenage girls were hopping on the light rail with their mothers, their new TS shirts, and some with lighted posters they made to try to get Taylor's attention from the stage. Those mothers are saints!